Spookily I was about to stick the CD of Lennon's Rock 'n' Roll album in my car when a link to this clip popped up on a forum I hang around. If you don't have the album already, get it NOW! Having a session where interesting things happen does give some inspiration to blog. Especially when it gives me an opportunity to have a dig at the 'internet' anglers who haven't a clue! 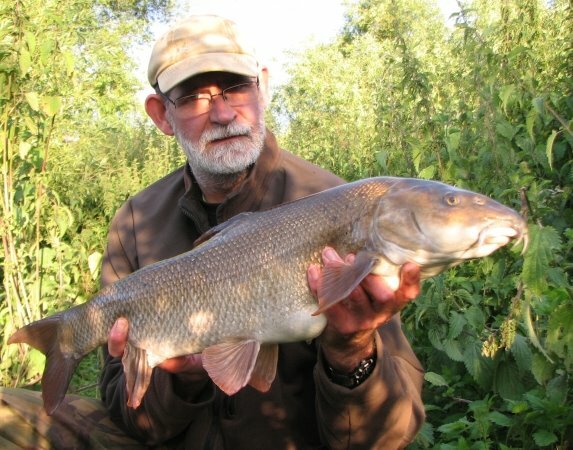 Reading the barbel forum post about the Trent to get an idea of conditions it seemed like people were giving up after a couple of hours because they were sick of their rigs being dragged out of position by the amount of weed coming down. 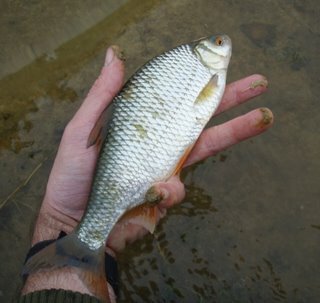 This is probably why I didn't see any barbel anglers on a couple of miles of river when I arrived. The river was about a foot up and carrying a tinge of colour, not muddy at all, but just enough to hide the river bed in three foot or so. Nice. My first port of call was a stretch I still haven't got around to fishing, and by the looks of things neither has anyone else this season. 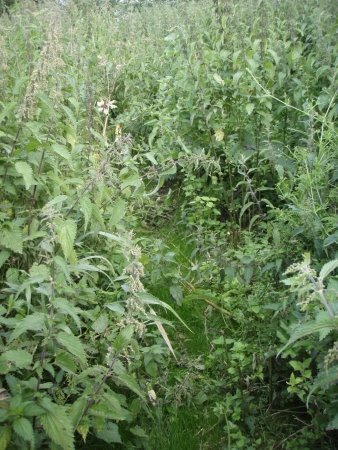 The banks were totally overgrown with head high nettles and other vegetation. I walked a good distance and found some nice looking spots. Overhanging bushes and creases, gravelly glides and streamer weed. I did spot some weed floating down too. I had plenty of time to look around elsewhere and return later so headed off to a favourite stretch. 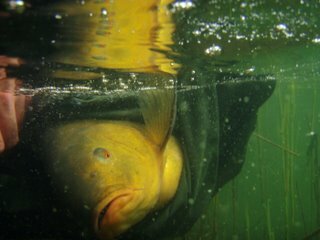 Again the river was empty of anglers, save for one packing his float gear away on the opposite bank. 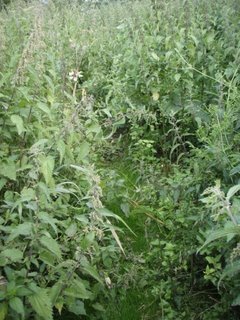 The path through the nettles had been opened up a little, but it was evident that the swims had hardly been fished since the season opened. The path beyond the favourite swims was almost impenetrable - and getting to one I fancied further down river would have required some machete work! There's a path in there somewhere! As this was my first river session of the year I wanted to kick off with a fish or two and soon had my gear in the very same swim I ended last season in. It's a bit of a banker despite the fallen willow having been washed away last winter. Taking my time I droppered out a sticky mix of seeds, pellets and groundbait onto the line of the crease. 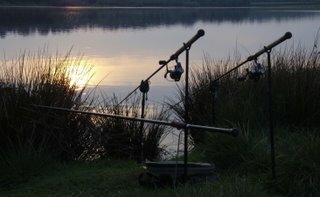 Slowly I set the rods up, and rather lazily left the same rigs on that I had last used in March. One advantage of braid is that you can get away with doing this without even retying the knots. 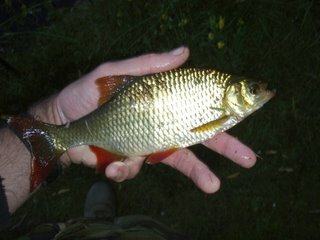 I did change the baits though! The rock hard boilies were removed and one rod rigged with a 21mm halibut pellet topped off with a seafood boilie to fill out the hair, and the other rod had one and a half Sonu Tuff 1s (blatant plug!) in Monster Crab and Mussel. I get lots of Sonu stuff for free (some is really good, some less so) so I felt I had to give these a try. Although they look a nice dark colour I was disturbed to discover that once they have been in the water they turn a bright emerald green! 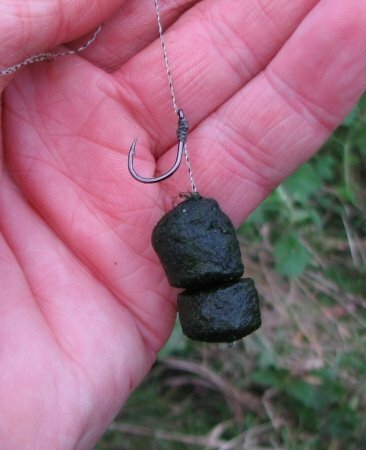 Both rigs had a large PVA mesh bag of mixed pellets added to the hook as is my habit. As soon as I cast the first rod out to the crease I realised what the weed situation was like as the rod almost immediately pulled right round and the lead bounced along the gravel. Oops! Now this is where I used my nous. I've fished in these conditions before and one of the tricks for keeping the bait out as long as possible is to fish so most of the line passes through slacker water. This particular peg is a small eddy, and the water by the bank flows upstream with the slack slightly downstream. 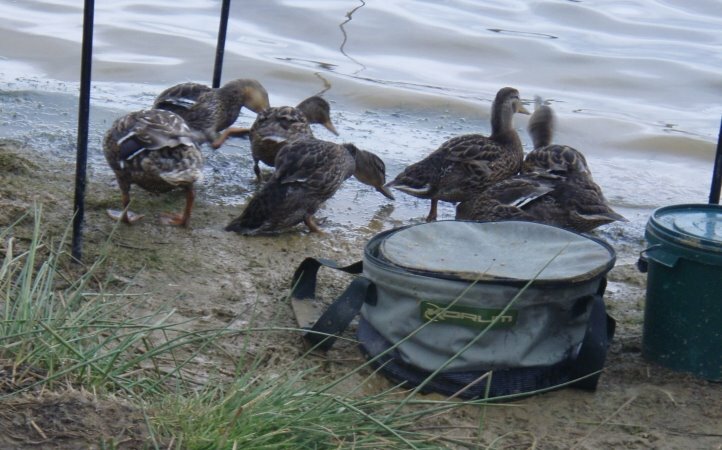 If I could position my six ounce lead (which will hold out better with weed on the line than a lighter lead) in the right spot, just inside the main flow, I'd be in with a chance. 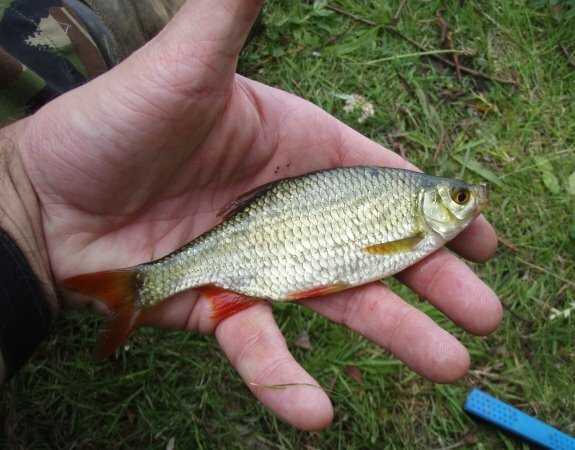 I cast the second rod to a fishless spot upstream, close to the bank to avoid as much weed as possible. This rod rarely produces, but it's another bait in the water. The upstream rod was collecting more weed than the downstreamer. It was a bit of a pain removing weed every few minutes, but I was able to leave the downstream bait out for at least fifteen minutes without too much weed building up on the line. That's long enough as when I fish the feeder for barbel I will often recast at a similar interval. There are other advantages that my rigs give me for fishing under these conditions. What people don't realise is that most drifting weed doesn't actually collect on your hook. It just looks like it does when you wind the rig in. Most of it actually collects on the line well above the end rig. The line isn't straight to the rod tip when fishing in a flow, it takes on a curve, and the weed collects at the point where the curve returns. As I use hooklinks of at least four feet this means the collected weed is not only above the rig, but often well upstream of it. The hooklink itself is in two parts. 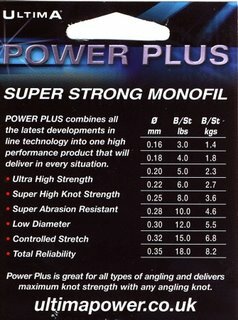 I have a long length terminating in a swivel to which I loop-attach a shorter length of about eight inches with the hook on the end. 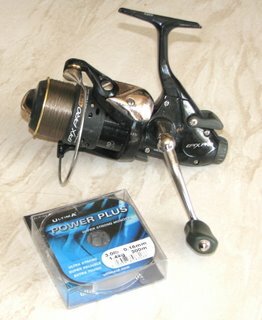 This arrangement was originally devised to make changing hooks easier (partly as most hooklink damage occurs in the last few inches by the hook). It has two unplanned advantages. Firstly the weight of the swivel helps pin the hooklink down in the critical area near the bait. Secondly it collects most of the weed that would foul the hook. The sun was shining with fluffy clouds in the sky so I expected action to occur later rather than earlier. At eight twenty the downstream rod pulled round more decisively than if a large lump of weed, or even a branch, had hit the line and the baitrunner creaked into life. 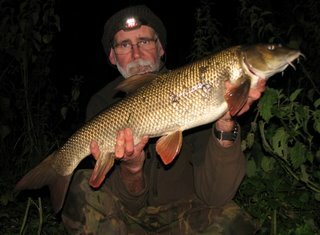 The first barbel of the season was on! 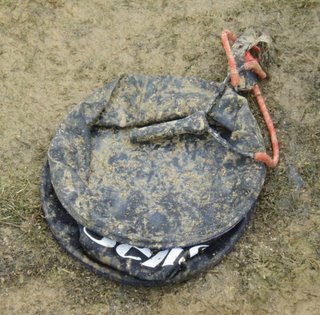 It put up a good scrap and once in the net I had to drop the weed enveloped lead in the net to be able to carry everything up the bank. 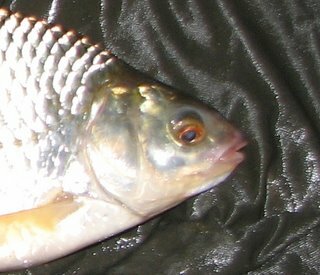 The fish looked very lean, particularly around the back end, with a seemingly large head. It was hard to judge the weight. The scales revealed it to be a nine pounder. 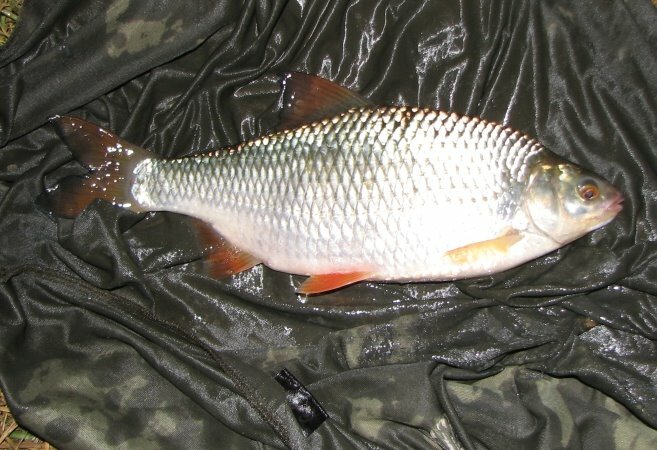 Hastily sacked, the bait wasn't recast while I set up the camera, took three quick snaps and put the fish back. More bait was droppered out before I recast. Then while washing the sticky residue off the dropper rod handle I lost the dropper. D'oh! The light was starting to fade but the weed showed no sign of disappearing. During daylight it was quite easy to see where the upstream rig had dragged to and judge when to wind it in for clearing of weed. But in the dark it was not so easy. 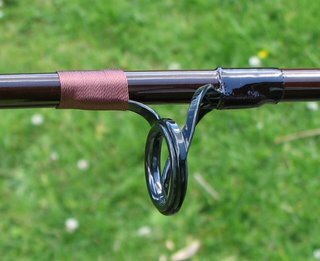 By eleven I'd had enough of dealing with two rods - the downstream one being less trouble - and put the upstream rod back in the quiver with the now useless dropper rod. I'd had a tidy away of the camera equipment and drunk my final cup of tea from the flask when the remaining rod pulled round again in a fishy fashion. This one felt a bit bigger. Or was the line carrying more weed? Once netted it looked a longer fish. Another lean one, it tried hard to make ten pounds but fell ounces short. The sacking and photographing process was repeated. I recast, had a final final cup of tea then headed for home half an hour later. In the end I think I picked the right swim as one that would have involved fishing in the main flow would have been frustrating in the extreme with all the weed in the river. 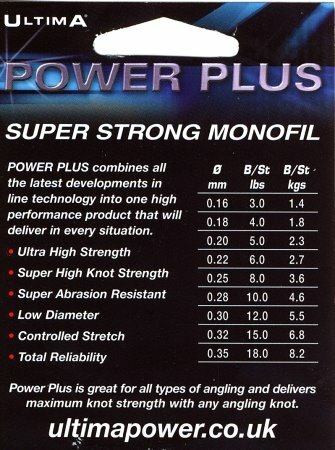 Now I have my barbel gear sorted out I guess I'll be back at 'em again soon. Where, I don't know. As the sun sinks slowly in the west I'm amazed that I've managed to keep this blog going as long as I have on a fairly regular basis. In my early twenties I kept a diary where I wrote each trip up in detail when I got home. That lasted a couple of years before dying the death, and it looks like this blog might be going the same way. I have an inherent loathing of routine and 'having' to do things. That's why I stopped pike fishing and writing articles - neither are compulsory activities, and neither is writing this blog. There may be a few rig thoughts to come, probably some tackle reviews, and possibly a tale or two if anything really interesting happens. But but for now, that's about it.